Wow…. What a dissapointing outcome. I went to bed around 7am CST this morning, finally too tired to keep watching the same stuff over and over again. I opened my eyes long enough at 11:30 to see the concession news scrolling across the television and then fall back asleep. Even if Kerry had won though, America is still failing. Granted, the highest percentage of voters since 1968 turned out, but we were still missing some 90,000,000 votes. What does this mean? 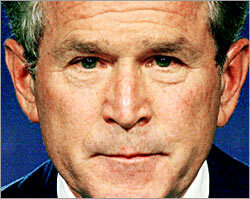 It means that approximately 140,000,000 voted for Bush. He won the election with 71% of the American public’s support. I don’t care what anyone says, there are no excuses. If you did not vote, you voted for Bush. Are you happy that you voiced your opinion so well? Seriously, I implore anyone and everyone to write me and try to explain why your vote would not have mattered. I will take the necessary time to assist you in your emigration from this country, because you are hurting America. Ranting aside for now, it is over. We can’t do anything about this outcome, but we can do as much as possible to change the outcomes of the future. Look for something related at this site in the near future. Ideas are rampant right now and I/We need to wait for them to settle before running forward with something. All I know is that I have finally reached my breaking point and something needs to be done. "American Broken Pride" by Jeremy Felt, unless otherwise expressly stated, is licensed under a CC BY-SA 4.0 International License. Next: Who’s Fault is it?